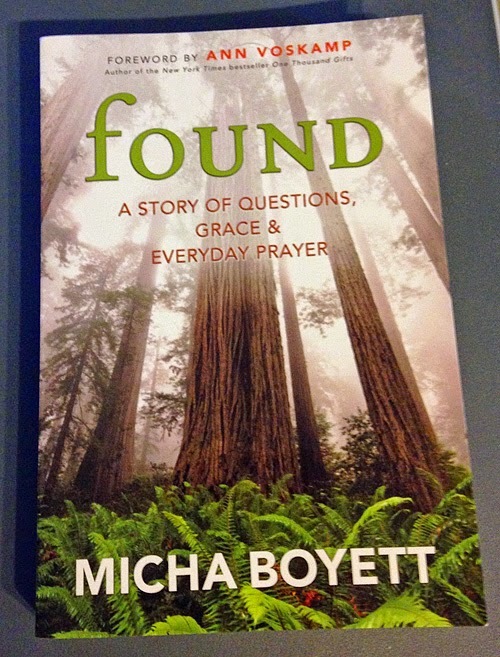 After having seen recommendations for Micha Boyett’s “found: a story of questions, grace & everyday prayer” on various blogs, I checked it out and put it on my wish list. I wasn’t quite sure as it seemed to be another new mother in search of God story. As someone who doesn’t have children, nor never will, new motherhood non-fiction isn’t exactly something that grabs me. (This is putting it mildly. The original rant went more like: "why are all these books about motherhood? !”) However, my Mum saw it on my wish list and sent it to me and I’m glad she did. You see, while she equates motherhood with the rhythm of a monk’s life, I quickly realized that all I had to do was replace “new baby” with “full time job” and it was then I could fully enter into her writing. So much so that I finished it in one day while on retreat — and that’s with three naps throughout the day. Her book got me thinking about rebalancing my life: not letting work consume, not falling back into “doing” church, about my calling. Micha’s book is partly about making peace and partly about God making peace within her in the sense that she looks for God and starts to see God everywhere. It’s not her pre-baby prayer life but it’s just as valid. I cried throughout chapter 34, seeing myself in that bathtub, leaving me with the sense that not only did I need to rebalance, listen to God, but also to trust God and that last ended up being my focus for the rest of the retreat. More on that a little later.